There’s no denying the power of a good delay; ranging from subtle to smashing, this ambient effect is one of the cornerstones of modern music. The Mirror Image Delay brings this atmospheric effect to your rig, giving you the ability to create depth with a simple slapback or develop an epic soundscape with modulated repeats. Digital, Analog, and Tape modes each with two voicing variations make this expressive and inspiring pedal indispensable. It even has the option to add a dotted-eighth note for those Irish-inspired washes of sound. The delay tails continue when the pedal is bypassed, ensuring a natural sound. 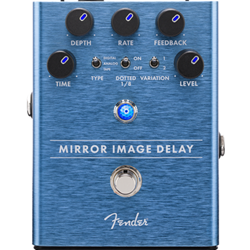 Designed by our in-house team of experts, the Mirror Image Delay is an all-original circuit. We consulted with a plethora of players while designing this pedal, and the resulting stompbox is packed with stage-ready features. The chassis is crafted from lightweight, durable anodized aluminum, and the Amp Jewel LED gives your pedalboard the classic Fender look. The LED-backlit knobs show your control settings on a dark stage at a glance. We even made swapping batteries quicker and easier with our exclusive "patent applied for", magnetically latched 9V battery door.Expressive and inspiring, the Mirror Image Delay is the latest offering from the company that defined legendary tone Fender.